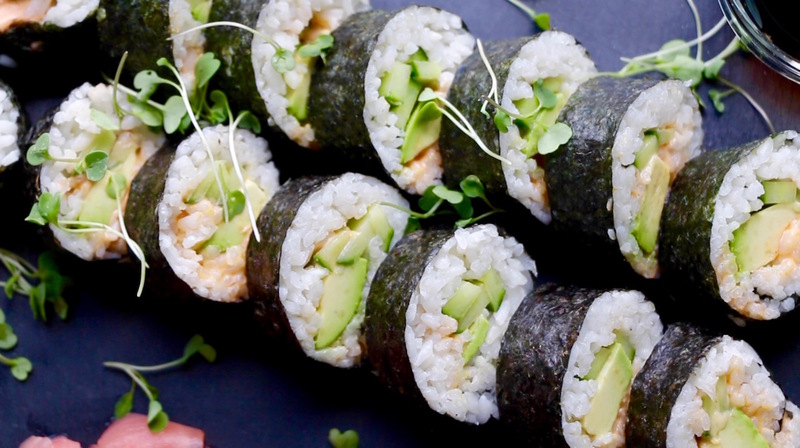 Making delicious sushi rolls at home is easy, you just need a few ingredients like avocado, cucumber, nori, and sushi rice. Rinse the rice in cold water and place in a saucepan. Add water, bring to a boil. Stirr, cover, reduce heat to low and simmer 15 to 20 minutes or until all water is absorbed. Add salt, rice vinegar and maple syrup to the rice. Mix well and set aside. In a small bowl, mix the vegan mayonnaise, sriracha sauce and maple syrup. Set aside. Lightly moisten hands with water, then gently spread about 3/4 cup rice onto nori in even layer, leaving 1/2-inch border on long end opposite you. Arrange the cucumber and avocado on rice in the center the sheet and add a tablespoon of spicy mayonnaise. Roll up the bamboo mat slowly, tucking in the closest end of the sushi roll to start a roll and press lightly with both hands. Remove the roll from the mat and leave to sit with the joining edges downwards. Using a lightly moistened sharp knife to trim the ends, then cut into 6-8 pieces. Serve with the pickled ginger and little bowls of soy sauce. Hello, sorry which step do you add the maple syrup? 2 or 3? Or both? This recipe is delicious!!! It will definitely be a staple in my home! I made this with avocado and mango. An absolute hit! Thank you. Really nice recipe!! Thank you!! Where can I find sushi rice or what rice can I use in place of it? There are no specialty stores near me. This style is called kimbab. Not sushi. amazing !!! thank you! we ate all 3 rolls tonight :)) so tasty and simple! best vegan cooking site ever! I loooooove this !!! Made it with carrots, scallions and mushrooms too …. addictive that’s all I can say ! I always make 3 times the measurements 🤣😂🙈🙈🙈!!! Thank you so much for sharing!!! What are some options (veggies or grains) to mix with the sushi rice or replace the rice?